Inscription: Names of Hermes, Ptolemaios, and Skepsis in Greek. Secondary Inscription: Group of five Greek characters along the edge of the rim. 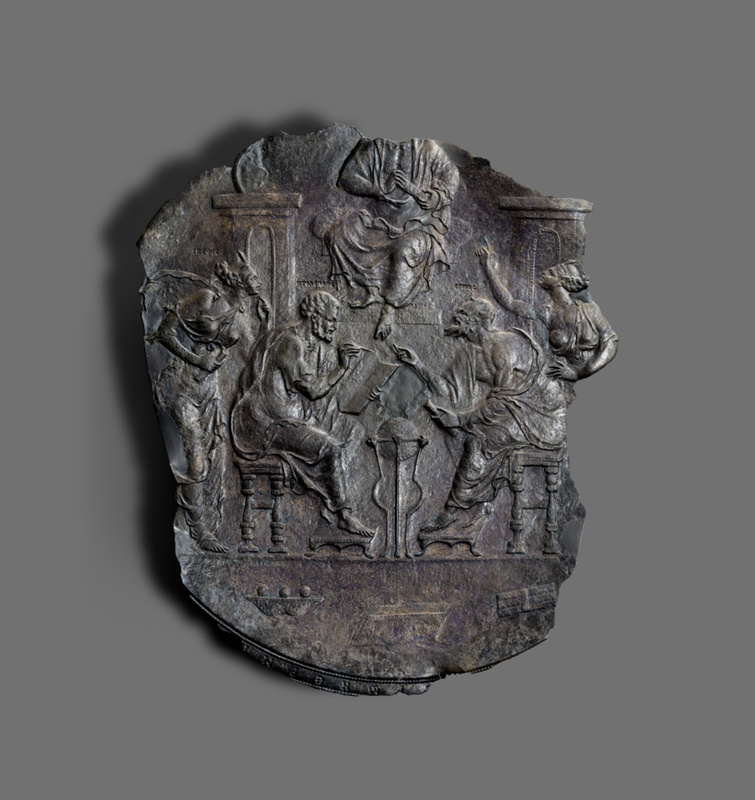 Two seated philosophers, labeled Ptolemy and Hermes, engage in a spirited discussion on this fragmentary plate. A woman stands behind each man, gesturing and partaking in the exchange. The woman on the left is identified as Skepsis. Above the two seated men, an unidentified enthroned man is partially preserved. The scene on this plate has been interpreted as an allegory of the debate between Myth and Science: Ptolemy, the founder of the Alexandrian school of scientific thought, debating Hermes Trismegistos, a deity supporting the side of myth. On technical, iconographic, and stylistic grounds, some scholars had questioned the authenticity of this plate and suggested that it may date instead to the 1500s A.D. More recent, detailed study of the plate, however, has confirmed its antiquity. Galerie Nefer (Zurich, Switzerland), sold to the J. Paul Getty Museum, 1983. Pleket, H.W., R.S. Stroud, eds. Supplementum Epigraphicum Graecum 34 (Amsterdam: J. C. Gieben, 1984), p. 445, no. 1667. "Acquisitions/1983." The J. Paul Getty Museum Journal 12 (1984), p. 258, no. 144. The J. Paul Getty Museum Handbook of the Collections. 1st ed. (Malibu: J. Paul Getty Museum, 1986), p. 62. Cutler, Anthony. "The Disputa Plate in the J. Paul Getty Museum and its Cinquecento Context." The J. Paul Getty Museum Journal 18 (1990), pp. 5-32, figs. 2-12, 14. Scott, David A. "A Technical and Analytical Study of Two Silver Plates in the J. Paul Getty Museum." The J. Paul Getty Museum Journal 18 (1990), pp. 33-52, figs. 1-4, 7-8. The J. Paul Getty Museum Handbook of the Collections. 3rd ed. (Malibu: J. Paul Getty Museum, 1991), p. 59. Balty, Jean Ch. "Skepsis," In Lexicon Iconographicum Mythologiae Classicae VII (1994), p. 791, p. 791, no. 2. Field, J.V. "European Astronomy in the First Millenium: The Archaeological Record," Astronomy before the Telescope. Christopher Walker, ed. London: British Museum Press, 1996, pp. 112-13, fig. 36. Bodel, John, and Stephen Tracy. Greek and Latin Inscriptions in the USA: A Checklist (New York: American Academy in Rome, 1997), p. 12. The J. Paul Getty Museum Handbook of the Collections. 4th ed. (Los Angeles: J. Paul Getty Museum, 1997), p. 58. Towne Markus, Elana. Masterpieces of the J. Paul Getty Museum: Antiquities. (Los Angeles: J. Paul Getty Museum, 1997), pp. 126-27. Gentile, Sebastiano and Carlos Gilly. Marsilio Ficino e il ritorno di Ermete Trismegisto. Biblioteca Medicea Laurenziano di Firenze (exh. cat. ), October 2, 1999-January 8, 2000. Firenze: 1999, ill. p. 14. The J. Paul Getty Museum Handbook of the Collections. 6th ed. (Los Angeles: J. Paul Getty Museum, 2001), p. 58. The J. Paul Getty Museum Handbook of the Antiquities Collection (Los Angeles: 2002), p. 202. Mango, Cyril, ed. The Oxford History of Byzantium (Oxford: 2002), p. 98. Holzhausen, Jens. "Hermes und Ptolemaios. Zu einem Silberteller im Getty-Museum." In For the Children, Perfect Instruction: Studies in Honor of Hans-Martin Schenke on the Occasion of the Berliner Arbeitskreis für koptisch-gnostische Schriften's Thirtieth Year, edited by H.-G. Bethge et al. (Leiden: Brill), p. 291-303. The J. Paul Getty Museum Handbook of the Collections. 7th ed. (Los Angeles: J. Paul Getty Museum, 2007), p. 41, ill. The J. Paul Getty Museum Handbook of the Antiquities Collection. Rev. ed. (Los Angeles: J. Paul Getty Museum, 2010), pp. 212-213. Scott, David A. Ancient Metals: Microstructure and Metallurgy (Los Angeles: Conservation Science Press, 2011), vol. 1, p. 58, fig. 7.12. Dekker, Elly. Illustrating the Phaenomena. Celestial Cartography in Antiquity and the Middle Ages (Oxford: Oxford University Press, 2013), p.12, fig. 1.2. Dekker, Elly. Illustrating the Phaenomena: Celestial Cartography in Antiquity and the Middle Ages. Oxford University Press, 2013, p. 12, fig 1.2.